The Lovejoy Opsis Building was constructed in 1910 as the Stables for the historic Marshall-Wells Hardware Company. It was constructed in the Northwest “Slabtown” area where Portland’s early lumber mill workers lived. This stout building has ground floor walls of brick four wythes thick that steps to three wythes on the second floor. The heavy timber wood columns and floors create a generous 13′-2″ floor-to-floor height. This building was owned and operated by Marshall-Wells through the 1940s. Since that time, it has been slightly modified by new owners and used as a bindery, sheet metal and machine shop. 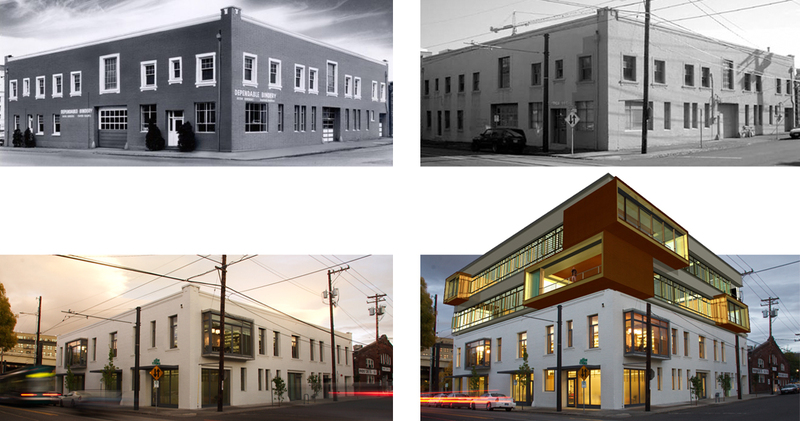 With a prospering business and limited space at their current Northwest Portland studio, Opsis purchased the building, renovating the historic building at the corner of 17th and Lovejoy to provide ground floor office lease space and second floor offices for their firm.